This is a Cinderella stamp. It’s also called a Poster stamp. This one is about 2″ horizontal and a little over 2″ vertical. Some time ago, I bought a lot of advertising stamps and didn’t think too hard about doing any research on them. Turns out (as you can read in the link above) everyone was Over.The.Moon for advertising stamps in the early part of the 20th century. I don’t know exactly what these wacky ancestors did with the stamps, since they seldom had glue on the back. 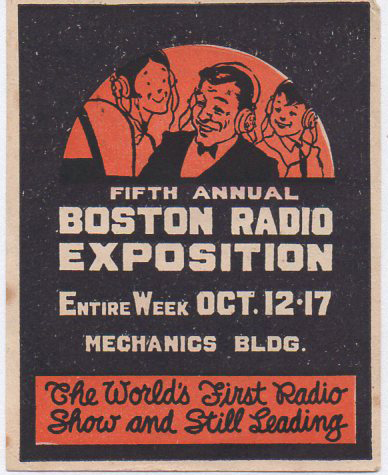 Posted in Bob Lawrence Photography and tagged Fifth annual boston radio exposition, Poster stamp. Bookmark the permalink.